After these Financial Assistance forms are filled out then they will have to be approved by the church committee in charge of the financial assistance for the church or the church administrative authorized to make these decisions. The church is always the one that is willing to help those in time of need. There is always a time in everyones life that we need some kind of help whether it be spiritual or financial. Good church financial management typically involves the development of sound financial policies and procedures, hiring or appointing someone who is educated in money management to oversee the church funds, and at the same time respects the denominational and congregational values and policies regarding the financial transparency. In general, a financially, respectable and healthy church will incorporate both the transparency and accountability into the church's policies and procedures. It is a great idea to appoint a financial committee to oversee these financial matters and maybe even the church treasurer to be held accountable for this committee. Some churches may even want to hire an outside accountant to reconcile the church books every year. 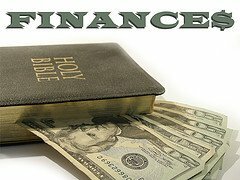 Large denominational churches may have their own financial management policies that provides various church financial management tools to individual congregations to help prevent financial difficulties. I am always amazed at the power of religion within a church at a time of hardship. Many people even say that religion was invented to provide relief for people over the dark ages and over time this has been proven to be true to some extent. Return to Home Page from Church Financial Assistance.